Networks created by swarming micro air vehicles (SMAV) are under study at the US Army Research Lab's Micro Autonomous Science and Technology (MAST) center. The Army's MAST center has been funded for five years with an option for five more. The following four partners are contributing research; the University of Maryland, the University of Michigan, the University of Pennsylvania and BAE Systems. 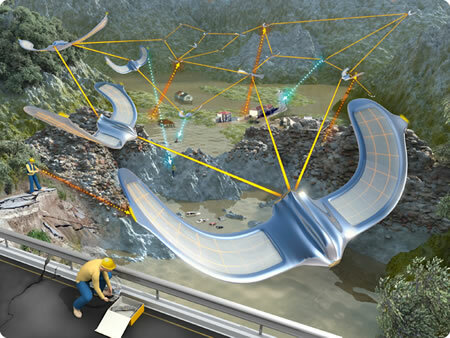 "A networked swarm can co-ordinate through sensing, communication and mobility to form a virtual "super-organism" composed of a number of flying...vehicles that can penetrate any structure and find targets of interest," says the chairman of Maryland's aerospace engineering department and professor Darryll Pines. The MAST partners would do well to take a look at the SMAVNET project (Swarming Micro Air Vehicle Networks for Communication Relay) at the Ecole Polytechnique Federale de Lausanne in Switzerland. Their system makes use of minimum cost MAVs which rely on local communication with immediate neighbors and proprioceptive sensors which provide heading, speed, altitude and angular velocities. We consider two approaches in designing the swarm behavior of the SMAVNET. The first consists in using artificial evolution to automatically design controllers. Resulting swarm controllers are then analyzed and rule sets are extracted to serve as a basis for hand designing swarming in the future. The second approach consists in taking inspiration from army ants, which are capable of optimally deploying to search for and maintain pheromone paths leading to food sources in nature. The earliest reference to this idea that I know about appeared in Changeling, a 1980 story by Roger Zelazny. In the story, solar-powered tracer birds formed a surveillance network. Read a bit more at US Army funds center for swarming MAV technologies, Autonomous UAV Surveillance Swarm and The SMAVNET project.